About a week ago, I Tweeted that I was sweeted out and ready for some savory recipes. So, of course when it came to my turn to choose a recipe for our Twitterbake from Nick Malgieri‘s latest book, Bake!, I chose pound cake! I’m a big fan of pound cake, so I’ve tried a lot of recipes. One of my favorites comes from a cookbook I picked up in New Orleans about 18 years ago. 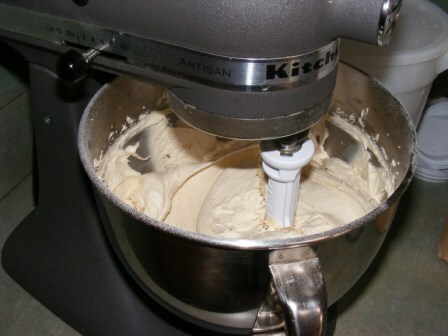 It’s also one of the simplest pound cake recipes I’ve ever made. And that’s been true of the best pound cake recipes I’ve found: they are simple, straightforward, and result in a cake that it moist, flavorful, and not overly heavy. So, I was excited to try Nick’s pound cake recipe. Recipes, in fact. 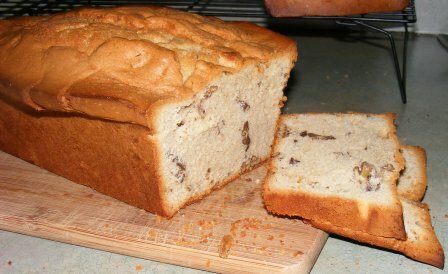 He offers a basic recipe, called High-Ratio Pound Cake, and six variations. One of those variations, New Orleans Praline Pound Cake, piqued my interest, so that’s the one I chose for our Twitterbake. First, a little history. Pound cake got its name from the volume of its four main ingredients. A classic pound cake — the one your great-great-grandmother used to make — called for one pound each of flour, butter, sugar, and eggs. As you can imagine, this resulted in a huge cake. As family sizes began to shrink, home cooks altered the recipe to make a smaller cake. As long as they kept the ratios the same, they could adjust the size of the cake to suit their needs. Sounds a lot like baker’s math, huh? The basic pound cake batter is just that — basic. Flour, sugar, butter, eggs, baking powder, salt, vanilla, and lemon zest. And even the praline variation was simple. A bit of brown sugar substituted for some of the granulated sugar, and some cinnamon, a few tablespoons of dark rum or bourbon, and a cup of pecans added to the batter. When I had mixed up the batter, I was surprised at how light and fluffy it was. Pound cake batter is usually heavier, almost doughy, so I was anxious to see how the cake would turn out. 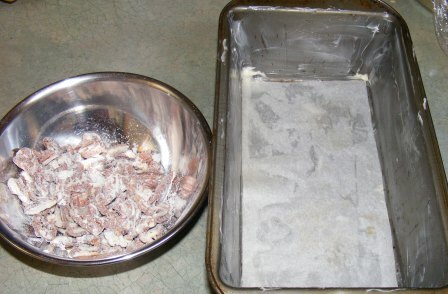 Just before adding the batter to the prepared pan, I folded in the pecans. As you can see in the picture above, I tossed the pecans with a small amount of flour before folding them into the batter. The recipe instruct you to do this, but doesn’t say why. The reason is that it keeps the pecans from sinking to the bottom of the loaf. 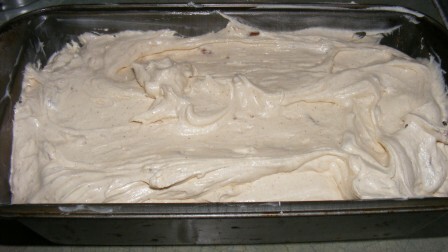 Once I folded in the pecans, I scraped the batter into the pan and smoothed the top a bit. I baked the loaf in a 325°F oven for about 75 minutes, until the tip of a knife inserted in the center of the loaf came out clean. I cooled the loaf in the pan for a few minutes, then removed it to a rack to cool completely. This loaf rose like crazy. It puffed up so high above the top of the pan that it looked almost like a soufflé. The praline loaf is in the back in this picture. The other loaf is a vanilla bean loaf that I mixed up while the praline pound cake was baking. As I sliced into the loaf, I thought it looked a bit like a nut bread. But don’t let looks fool you. This was definitely a pound cake. The praline flavor was subtle and delicious. It didn’t overpower the classic pound cake flavor, but rather complemented it beautifully. 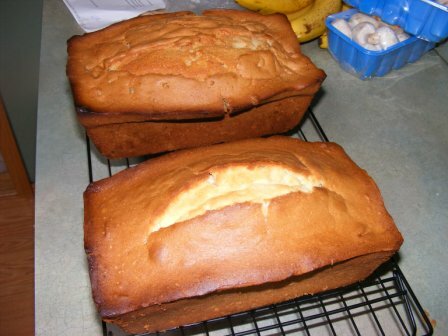 I want to try the basic pound cake recipe and a few more of the variations. But based on this recipe, I have to say Nick Malgieri has nailed the pound cake. This is easily one of the best pound cakes I’ve ever had. And it may just replace my tried and true recipe from New Orleans. Hmm, I also made it but can’t really understand everybody’s excitement. It’s ok, but not a keeper recipe. Glad you like it so much. Looks absolutely wonderful. It was nice to see the photo of the batter because when I was making this I thought I had not done the batter correctly as it was so light and fluffy, etc. Anyway, mine looked just like yours, so I figure that I did okay. Thanks for the process photos, always nice to see. Whatever it was you were making with those mushrooms in the background in the photo, I want some of that, too! Great pick, Mark particularly loved having it in his lunches this week. Thanks, Kayte! I really enjoyed this pound cake. I still can’t believe how fluffy the batter was and how much the cake rose in the oven. Definitely a recipe to keep. The mushrooms were for Paris mushroom soup.